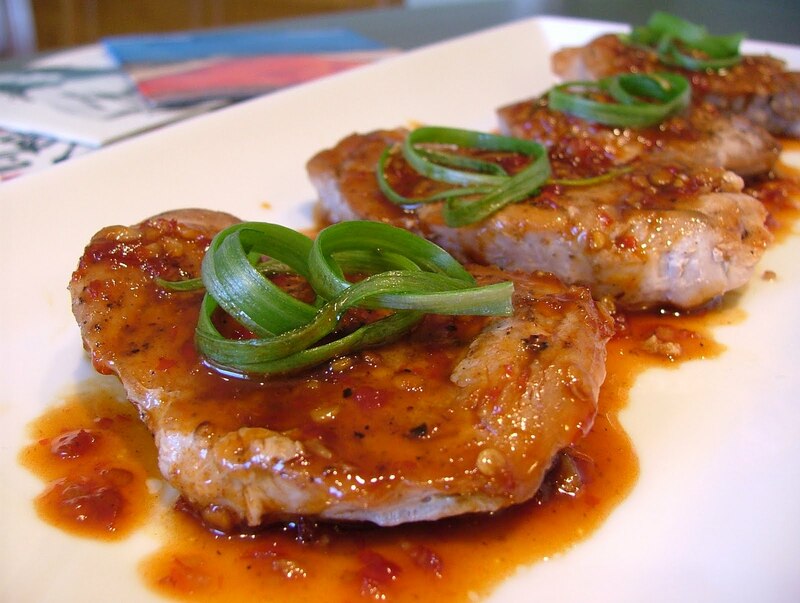 You’ve heard of the band Red Hot Chili Peppers, well this is their culinary counterpart, Red Hot Pork Medallions, covered in a sweet and spicy sauce! This dish is an adaptation of a recipe from a 2007 Bon Appetit magazine. If you enjoy fiery cuisine, then go ahead and give this one a try. May I suggest pairing this cooking experience with a side of Red Hot Chili Pepper’s tunes as both the songs and the sauce have equal amounts of “kick”! Tip: Most supermarkets carry five-spice powder and chili-garlic sauce. Look for the chili-garlic sauce in the International food section. Cut tenderloin crosswise into 5 or 6 slices. Using a meat mallet, pound medallions between 2 sheets of plastic wrap to ½-inch thickness. Sprinkle both sides of medallions with five-spice powder, salt and pepper. In a small bowl combine chicken broth, maple syrup and chili-garlic sauce. Set aside. In a large skillet, heat oil over medium heat. 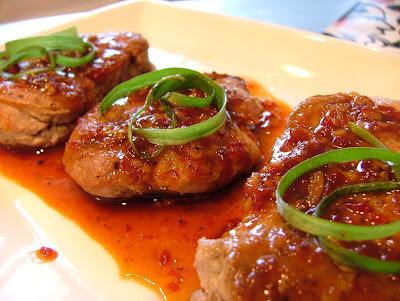 Add pork medallions. Cook until browned and cooked through, about 3 minutes per side. Remove medallions from skillet and transfer to a platter. Add chicken broth mixture to skillet. Bring to a boil and scrape up any brown bits at the bottom of the skillet with a wooden spoon. Continue to cook and stir until liquid is reduced to ¼ cup, about 5 or 6 minutes. Pour sauce over pork and top with green onions.